Anyone here from Libya? Can you explain why so many Libyans have decided to use the old flag of Libya instead of the newer one in these protests? In all honesty, anything is better than all-green..
New flag is Gaddafi's flag. It is the flag the Libyans had. 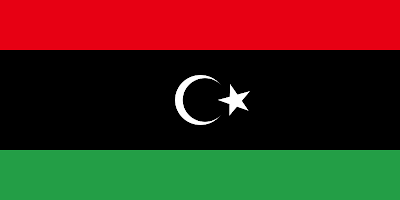 It is doubtful that the Libyans want the old monarchy back but that is a flag that they could all call "our flag", which is not the current flag. The best possible form of opposition to the current government really. Sadly, I doubt we'll see the end to this any time soon. You have to wonder what's going on in the minds of military commanders if they're still happily bombing protesters and civilians without giving it a second thought, why don't they just mutiny and hunt Gaddafi down and kill him like Ceaucescu? Why don't they just ignore orders and let the regime fall over on its own like Egypt? It's an absolute bloodbath. As for the other African nations letting their citizens travel to Libya as mercenaries, randomly murdering innocent Libyan civilians - shame on those governments too. Mali, Chad and possibly Nigeria - I'm looking at you. It's not that simple because many soldiers have already been burned to death for not shooting at protesters when they were commanded to. Others have fled whilst many have gone against him and joined the protests. The military is made up of a lot of people who joined to serve the public but there's also a significant number of well paid mercenaries who have had only limited contact with the Libyan public and are close to Gaddafi. In addition to that, mercenaries have been brought in from Nigeria, Guinea, etc. for US$2000 a day. you're twisting my words... I'm not saying that they shouldn't be overthrown, I'm saying that there hopes of getting a democratic country are quite slim. Your words not mine: "do you think that the country will be any better if qadafi is kicked off? If so, then you are wrong." And no, not every arab country is similar culturally, but Turkey is completely different. It is not completely different. Provide sources to support your claim. Go on. Look mate, if you can't take someone else's opinion, even if it's been proven by history (which it has) then just get off the student room. You fail. You look 'mate'. I'm jsut telling you your opinion is ridiculous, if not borderline racist. The Arab world has an array of different cultures, with more variety than Europe itself. 360 million and growing (more than the USA and the EU). You're saying all these people, admitting that they have different cultures, aren't capable of democracy. Why is that? Is the white West somewhat more superior than Arabs? You're the one talking out of your arse. I'll let you know I'm leaving TSR in a few days. So please reply a bit quicker. lolwut. All I've soon on news channels today and yesterday is libya. There is now report on Twitter that Facebook/Twitter access has been restored, and that Gaddafi's son is preparing a press conference in Tripoli. The Libyan Interior Minister has resigned, defected and joined the protests. There are also reports that an entire army battalion in Misurata have defected and joined the protesters also, and the tribes are trying to rally round and organise themselves. If all this is true, then I consider it likely that the noose is tightening and the net closing in. Possibly another Ceaucescu moment, as I said earlier. 1. Yes, Gadaffi should be kicked off, however I doubt that it will make the country any better. If so, then yes, I will be very pleased. 2. Turkey was built by the Ottoman Empire, lots of the middle east was built by Persians, Arabs and partly the Mughal Empire. They all had variously different cultures. 3. And no, whites are not superior to Arabs, however in the west the ability to maintain democracy is easier than in the middle east. I am not a racist man, and I think that everyone should be treated equally. Lots of people are protesting in Egypt once again, yet they claimed that the Junta would bring them democracy. Gadaffi was a good ruler - at first. Unfortunately his regime went on for too long, and people got fed up, naturally. Hopefully the middle east will become a democratic ally to the west, however notice how I say "Hopefully"
Good. Then your first post was absolutely pointless. Most of the Middle east was under Ottoman occupation for 400 years. Four centuries, where the empire's culture and language was enforced on Arabs. Just in case you didn't know. The cultures are very similar. Especially to the Levant area. Wiki it if you don't know what I'm talking about. Good to know that you're not saying that. Of course. Why wouldn't anyone hope for anything else. 2)Yes but the majority of Turks think they are better than Arabs. Their culture is merging with Arabic culture more and more (because of their current government), however when Ata-Turk was in power he revolutionalised Turkey and what defines Turkish culture. And finally yes, I do definitely hope that there will be democracy in the Middle East, however the chances are quite slim, and with the rising power of the Muslim Brotherhood, the chances are slimming. Gaddafi's appeared on state television saying he won't leave Libya and that he'll "die a maryr." Last show of defiance? "Sylvester Stallone, please sort your mum out. She's gone mental again and is on TV proclaiming to be the ruler of Libya"
Gadaffi was a good ruler - at first. Unfortunately his regime went on for too long, and people got fed up, naturally. Yeah, I'm finding it really interesting. I've now become transfixed by BBC news 24, because my dad's half Libyan. What do you mean you're "leaving TSR." Should the UK Government be liable for these terror attacks? Serious reasons not to vote for Mr Cameron and the Conservatives. Will Trump support Assad in Syria? Roads To Peace: If or how will peace come to Syria? Why won't the left let Austria do what they want with their own border?